Unit prices below include your 1-color custom imprint in one location (one side of the travel mug). Add $0.20 per extra color, per location. Add $0.20 for each extra imprint color. Production Time: 5-10 days after art approval. Rush 3 day production: add 15% to unit prices. Personalized Insulated Travel Mugs Custom Printed in Bulk. Promotional, Inexpensive. Lowest Cost in USA, Canada. Blue/Black, Green/Black, Pink/Black, Red/Black, White/Black, Yellow/Black. Sturdy Double Wall Plastic. 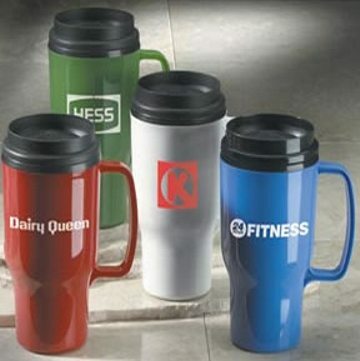 Our bulk custom imprinted travel mugs are double-insulated to keep your coffee or tea warm for hours. We supply wholesale personalized travel mugs at the lowest prices in the USA and Canada. Various translucent colors, with plastic liners and Black lids. Colors: Blue/Black, Green/Black, Pink/Black, Red/Black, White/Black, Yellow/Black picture). Production Time: 5-15 days after art approval. Rush 3 day production: add 15% to unit prices.